On Saturday, February 23, more than a thousand Scientologists and their guests assembled to celebrate the opening of the new Church of Scientology Pretoria. National, provincial and city dignitaries as well as South African royalty joined Church officials for the dedication ceremony. 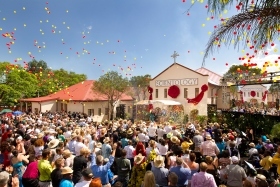 More than a thousand Scientologists, dignitaries and guests celebrated the opening of the new Church of Scientology Pretoria on Saturday, February 23, 2013. The Church stands on Stanza Bopape Street, just steps from Embassy Row and the Union Buildings, the seat of South African government. The Church’s new home stands on Stanza Bopape Street neighboring the Union Buildings, official seat of the South African government and home to the presidential offices. The campus, less than a block from Embassy Row, is comprised of five heritage homes originally constructed at the turn of the 20th century. The Church meticulously restored the Edwardian-style buildings and altogether transformed them into a 21st century Ideal Organization (Ideal Org) to accommodate an ever-growing congregation. Dignitaries on hand to welcome the new Church included ANC Chief Whip Dr. Mathole Motshekga, MP; Director of Programs for South Africa’s Constitution Hill, Mr. Thabo Madisa; CEO of Opera South Africa and Thembu royal, Prince Unathi Mtirara; Commissioner for South Africa’s Department of Corrections, Mr. Alfred Tsetsane; Coordinator at the Department of Education, Gauteng, Ms. Theodora Mohale; and National Coordinator Humanity’s Team South Africa, Anna-Mari Pieterse. The new Pretoria Church provides residents of Tshwane with an introduction to Dianetics and Scientology, beginning with the Public Information Center. Its displays, containing more than 500 films, present the beliefs and practices of the Scientology religion and the life and legacy of Founder L. Ron Hubbard. The Information Center also offers a detailed overview of the many Church-sponsored humanitarian programs—including a worldwide human rights education initiative; an equally far-reaching drug education, prevention and rehabilitation program; a global network of literacy and learning centers; and the Scientology Volunteer Minister program, now comprising the world’s largest independent relief force. The Center is open morning to night for visitors to tour at their leisure and return as often as they wish. The Church of Scientology Pretoria is the second new Ideal Org to open in 2013, following Cambridge, Ontario on February 9. A parade of Ideal Orgs opened over the past year: Padova, Italy (October 27); Tel Aviv-Jaffa, Israel (August 21); Los Gatos, California (July 28); Buffalo, New York (June 30); Phoenix, Arizona (June 23); Denver, Colorado (June 16); Stevens Creek in San Jose, California (June 9); Orange County, California (June 2); Greater Cincinnati, Ohio (February 25); Sacramento, California (January 28); and Hamburg, Germany (January 21). Through the coming year, more than a dozen new Ideal Orgs are scheduled to open—in Australia, New Zealand, Asia, Europe, England, South and North America. Other new Ideal Orgs opened in recent years include London, Brussels, Moscow, Berlin, Madrid and Rome in Europe; Johannesburg, South Africa; Melbourne, Australia; New York, New York; Washington, D.C.; Los Angeles, Inglewood, Sacramento and San Francisco, California; Tampa, Florida; Nashville, Tennessee; Seattle, Washington; Dallas, Texas; Quebec City, Canada; and Mexico City, Mexico. For a complete list of new Ideal Orgs of Scientology, visit Scientology.org.